Quercus phellos.Fruit.Franklin Bonner.New England Wild Flower Society.gobotany.newenglandwild.org. (Accessed 9/2014). Quercus phellos is a tree to 25 m tall, to 90 cm dbh, red oak group (subgenus Erythrobalanus); bark dark gray, rough, twigs slender, roots associated with ectomycorrhizal fungi (Decker and Boerner 1997). 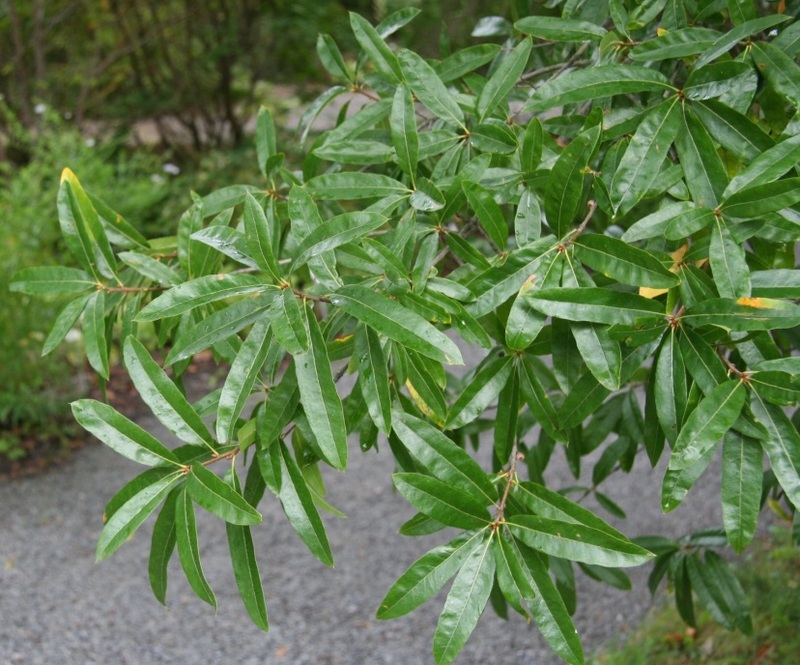 Leaves alternate, to 12 cm long, 2 cm wide, narrow, unlobed, willow-like, bristle-tipped. Flowers green, monoecious, male catkins, female flowers 1-few; blooms April-May, wind pollinated. 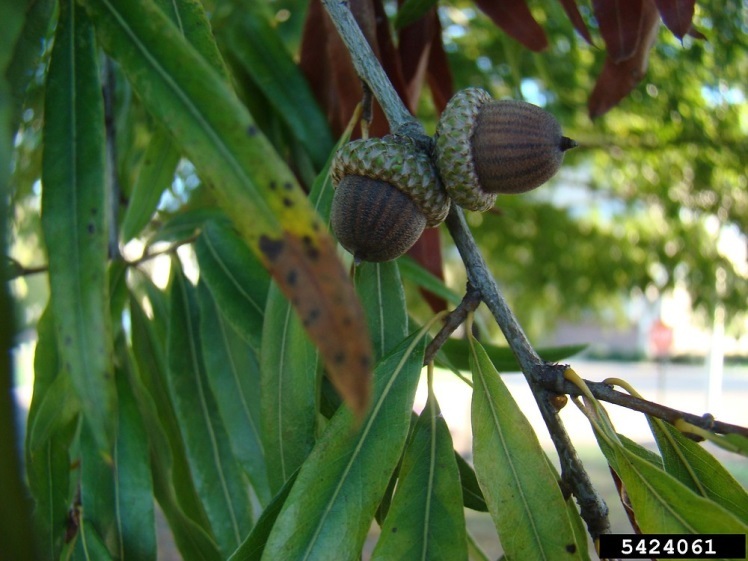 Fruit acorns small, to 1.5 cm long, cap shallow with fine scales, matures 18 months, Sept.-Nov., tannin content high. Seeds dispersed by squirrels, blue jays (Darley-Hill and Johnson 1981) and other animals that bury acorns. Acorns eaten by many birds and mammals that do not bury nuts (raccoon, foxes), (Martin et al 1951). Frequency in NYC: Infrequent in the wild. Widely planted throughout the City, along roads and in parks. (Rare, NYS S1, E). Origin: Native. Staten Island is the natural northern limit of range. Habitat: Swamp forests, moist soil pH 4.5-6.5 (USDA, NRCS 2010). Notes: Deer and rabbits eat twigs and seedlings, other animals eat buds (Martin et al 1951). Reproduces poorly in N.Y. Hybrids of Q. phellos (Q. x rudkinii, Q. x filialis, and Q. x heterophylla) produce abundant seed, and subsequent generations often produce pure Q. phellos again. This may be the way this species reproduces at the northern limit of its range (Richard Lynch, personal communication). Foliage eaten by Gypsy moth larvae and other insects (Burns and Honkala 1990). (See Q. alba).